Kiepe Electric is fitting the buses with its future-oriented In Motion Charging (IMC) concept. With IMC, the bus charges its batteries on the fly from the overhead lines. On sections of route with no overhead lines it runs on battery power. “This technology greatly increases the operating radius of our electric buses. Operators can run them 24 hours a day without having to schedule any breaks to recharge the batteries,” says Dr. Heiko Asum, Managing Director of Kiepe Electric. With this order, Knorr-Bremse and Kiepe Electric are writing the next chapter in the story of eco-friendly mass transit in Dayton: Dayton first introduced electric passenger transportation back in 1888, making it the city with the longest uninterrupted history of electric vehicle operation in the USA. The first electric buses took to the streets of Dayton in 1933 and have long since become an established part of the everyday street scene. Final assembly of the buses takes place at the Kiepe Electric plant in Alpharetta (Georgia). This is also where the company manufactures the traction system components, helping it to comply with the high local content requirements of the US vehicle market. 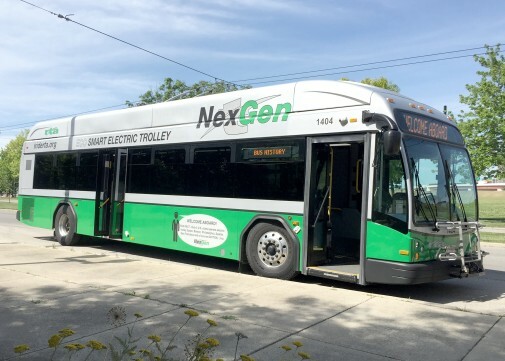 As in many other markets, in North America Kiepe Electric is an established player: In the meantime the company has developed and manufactured the traction systems for almost 800 electric buses here.